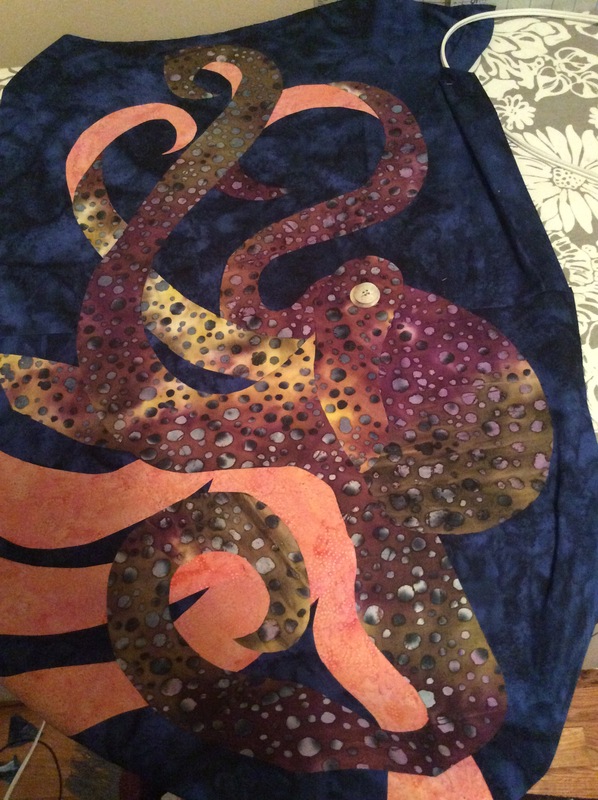 My sister and I started a fused fabric present for my octopus crazy niece. 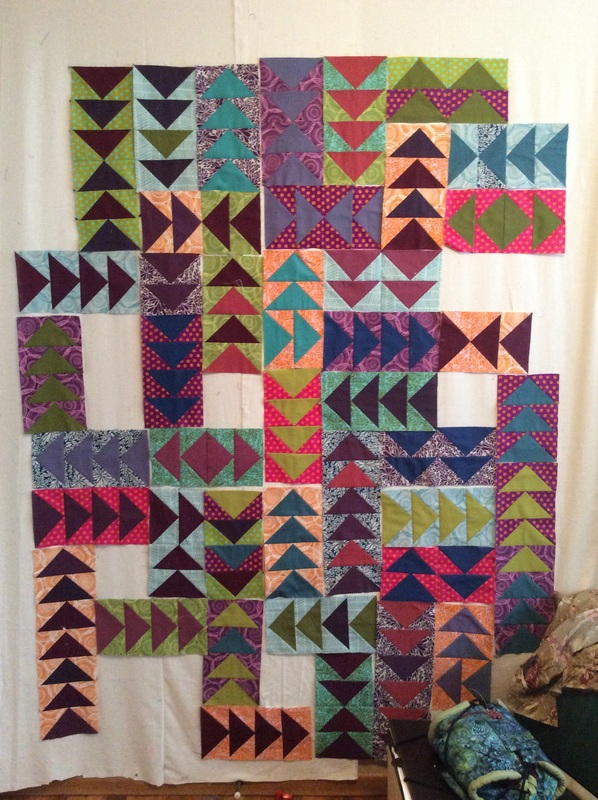 Still in progress, with a lot of buttons-for-suckers and quilting to add. 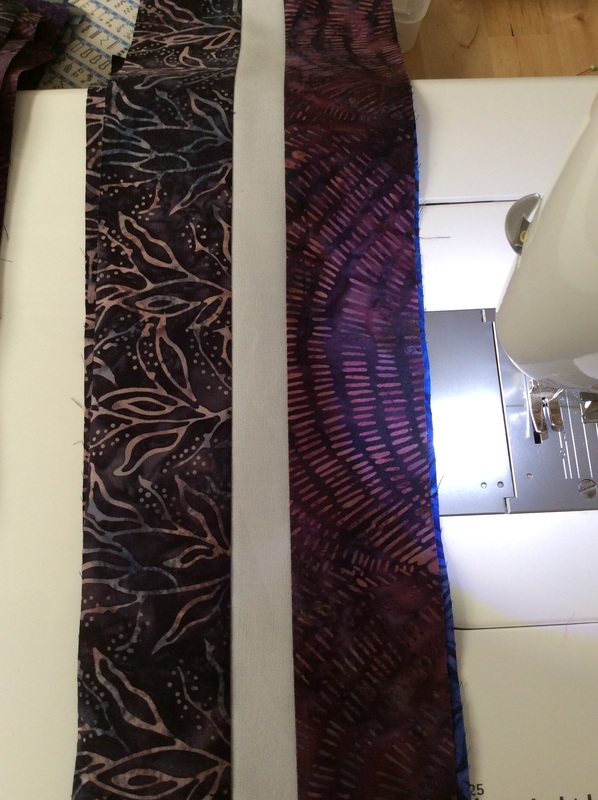 The purple/green spotty batik was perfect for it. 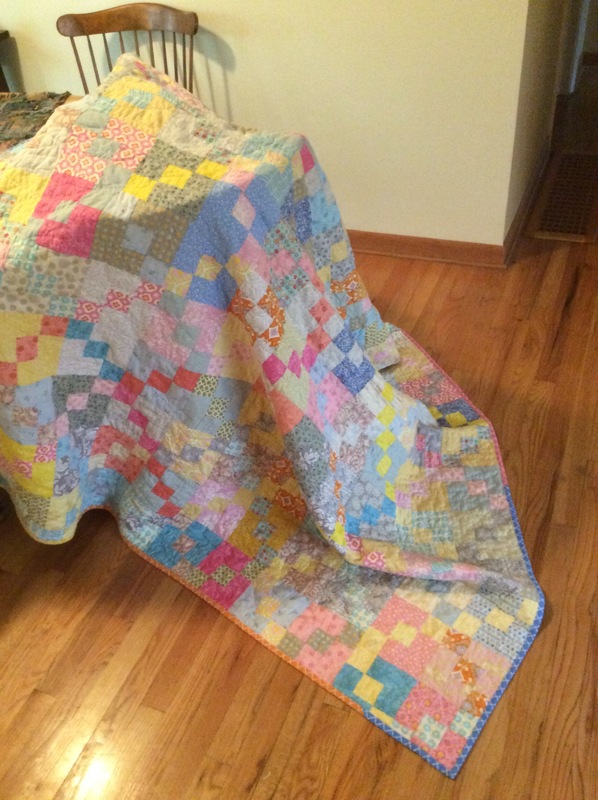 My niece, who lived in my basement with her family for several months this summer, has just moved out – along with the rest of her family and the dogs, but unfortunately leaving a cat behind – but before they left she told me that she wanted to make a quilt. She hadn’t seen before, but she had been watching me and felt like giving it a try. 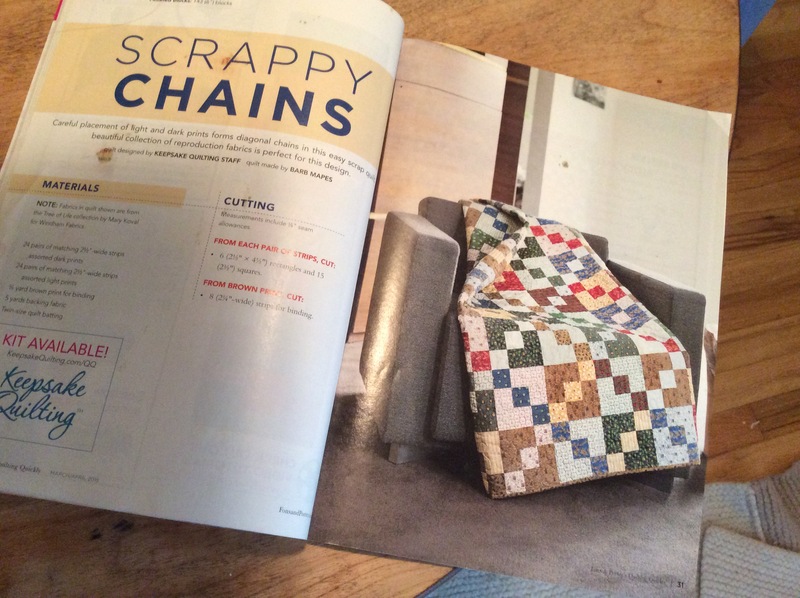 We found a fairly basic pattern in a quilting magazine I had – Scrappy Chains from the March/April 2015 volume of Quilting Quickly – and she spent the next two days cutting squares and rectangles from many pastels pulled from my stash and scrap bin. She was really dedicated, which was impressive from a girl we have trouble shifting out of bed before afternoon. 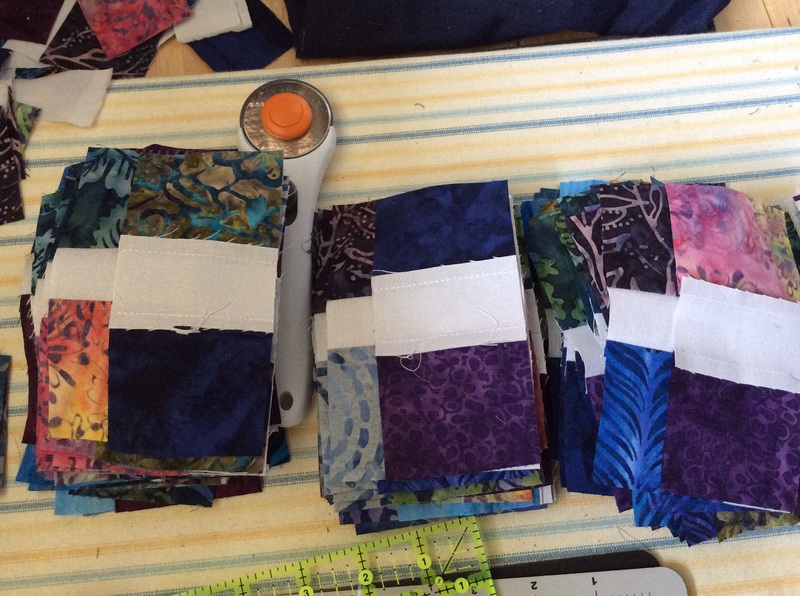 When the cutting was done, the sorting and matching began. 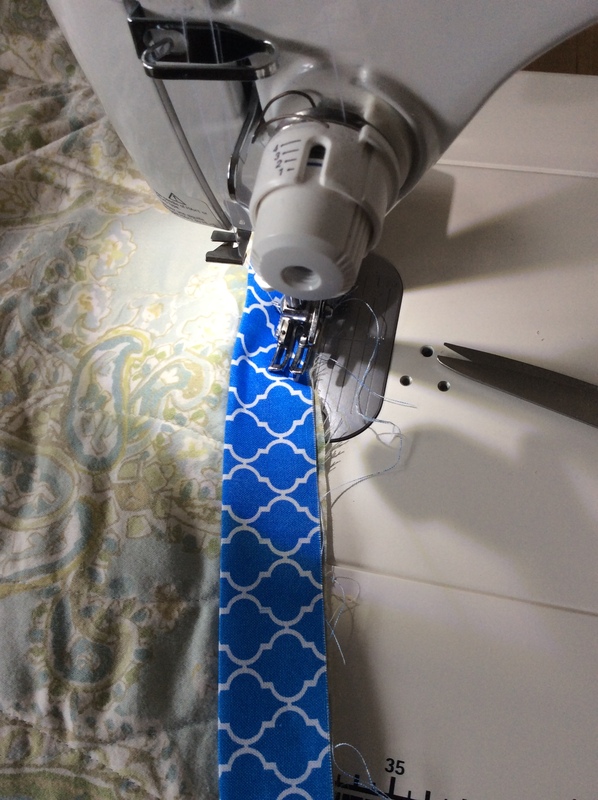 Next I gave her a quick lesson in sewing scant 1/4″ seams and pressing for nested seams, and she was off and running with the sewing machine. 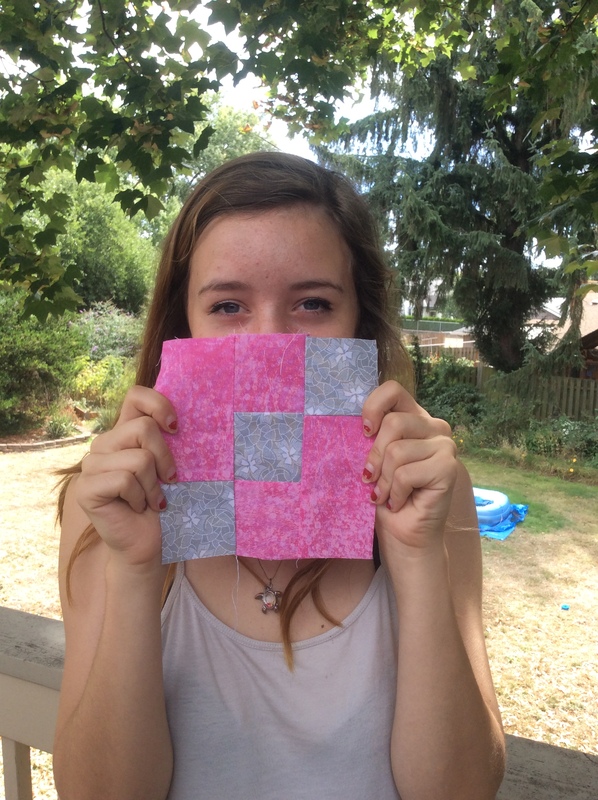 Her first ever quilt block! I went away the next weekend and by the time we got back, she had finished all her blocks. All 168! And very shortly after that, the top was done. 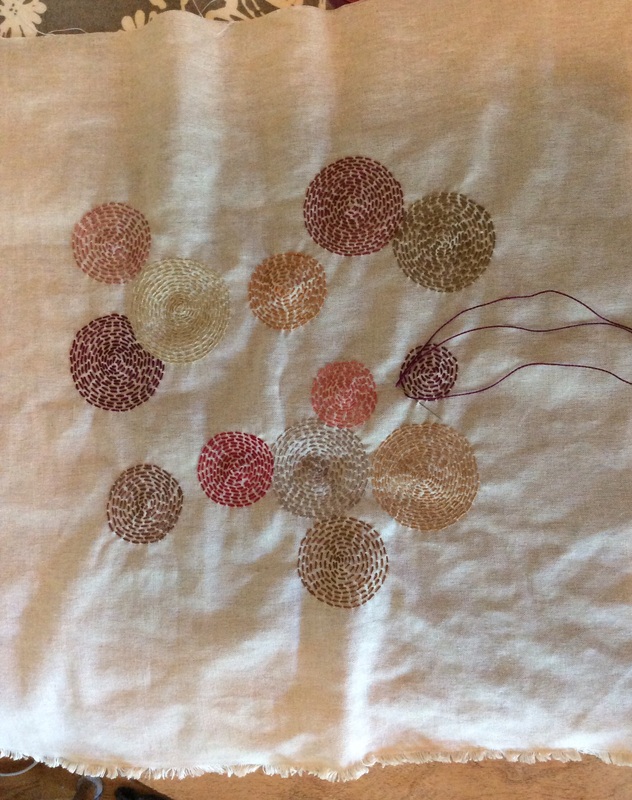 It isn’t perfect – but then very few are. There are some places where not everything matches completely, and some seams that had to be reinforced later. But it is lively, and colorful, and she did it all herself. 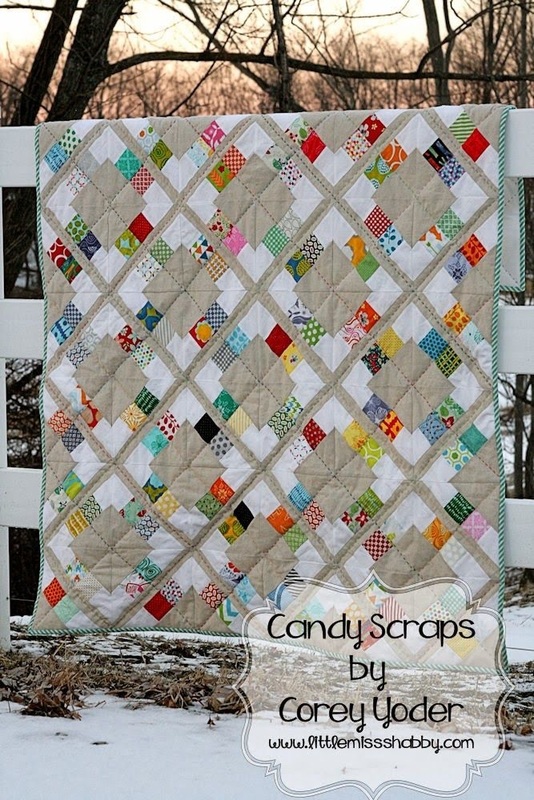 Very impressive for someone who had never sewn before! The next step was introducing her to the quirky locations that I have for pinning. I’m sure many people manage this step without needing a push broom to remove maple leaves, but that is an integral part of the process around here. Pinning is for sunny days at my house. 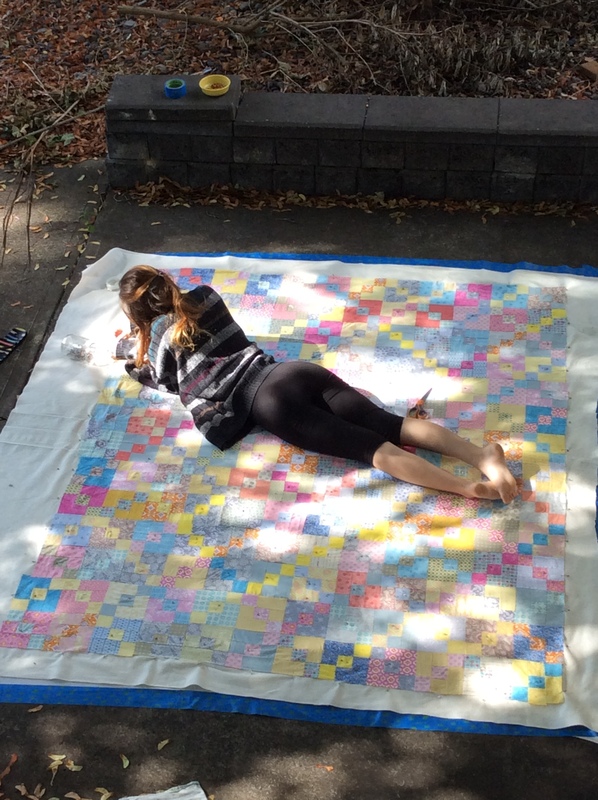 She wasn’t quite ready to quilt yet, so I took care of that step. 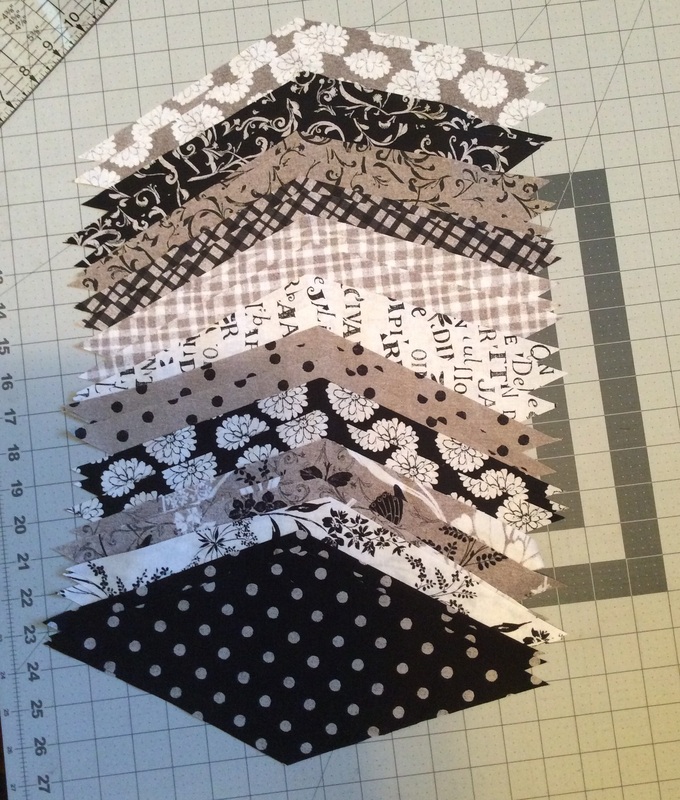 I went with curvy crisis-crossing lines, which is becoming one of my favorite overall quilting methods. 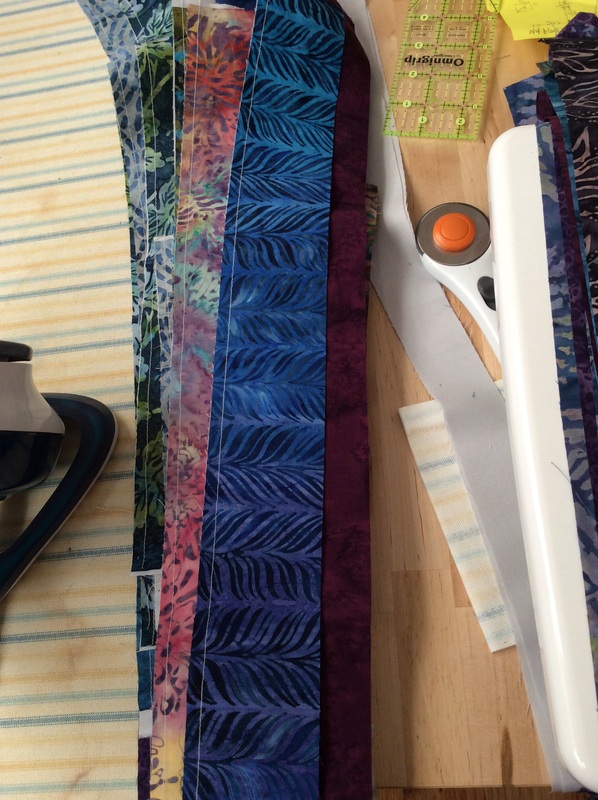 The binding I pulled from a jelly roll my kids bought me – it made it so quick to have the strips already cut. And the orange, yellow, pink, and blue fit in with all the many pastel colors she’d chosen. 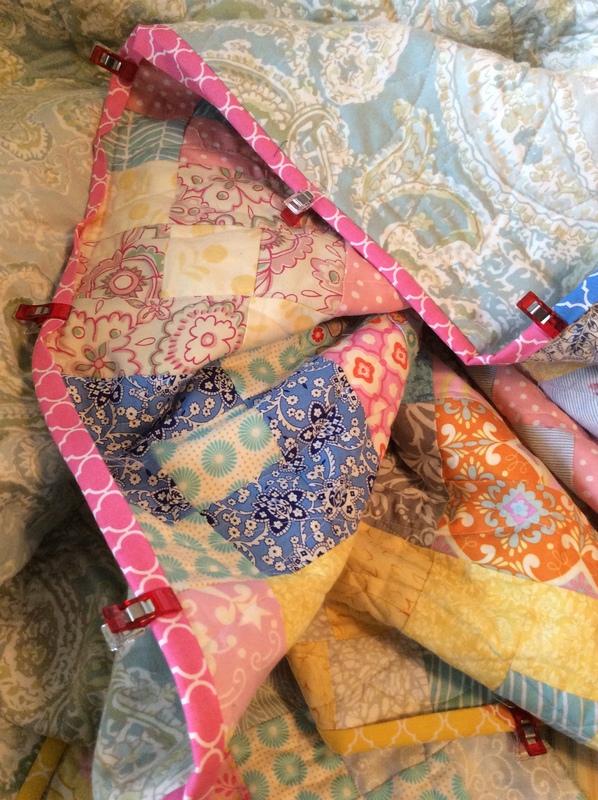 I trim and quilt and added the binding today. I so love the Wonder clips. I wasn’t sure I really needed them, but they are much smoother and less painful than the pins I used to use. I sewed the binding on both sides rather than hand sewing it. 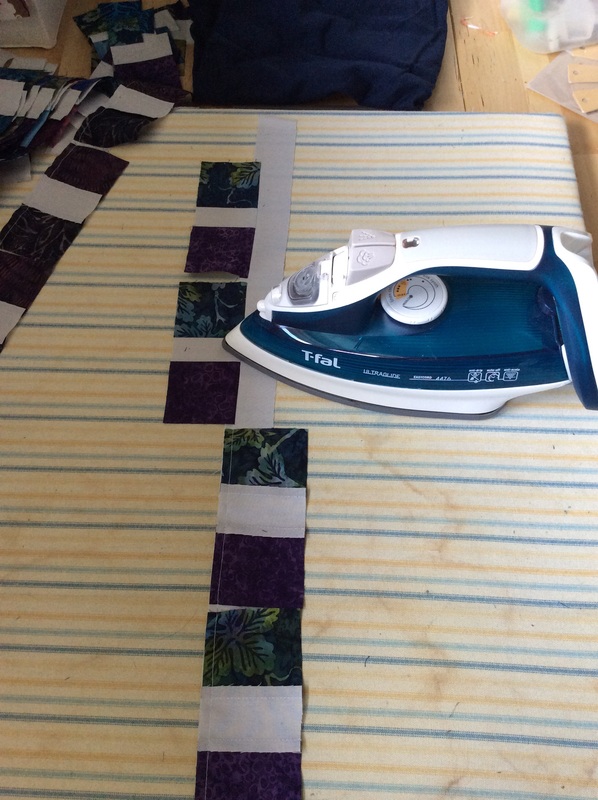 I’m doing that more and more often as it seems sturdier on quilts that will be washed a lot. And now it is done! Fresh out of the drier and ready to be given to her tomorrow. 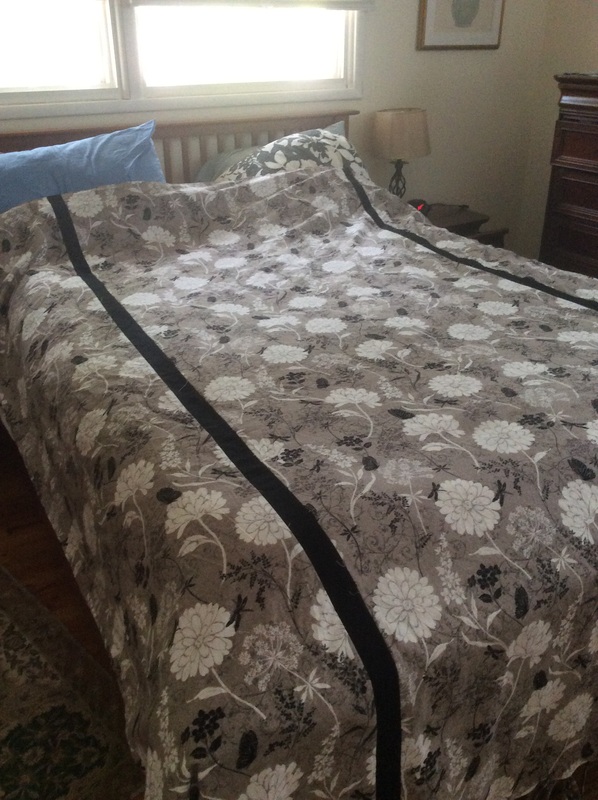 She picked out the fabric, and it looked great in her room (I don’t have a picture of it there, unfortunately) so I ordered a fat quarter of the whole fabric line – Jardin de Provence – to surprise her with a wall hanging to go above the bed. 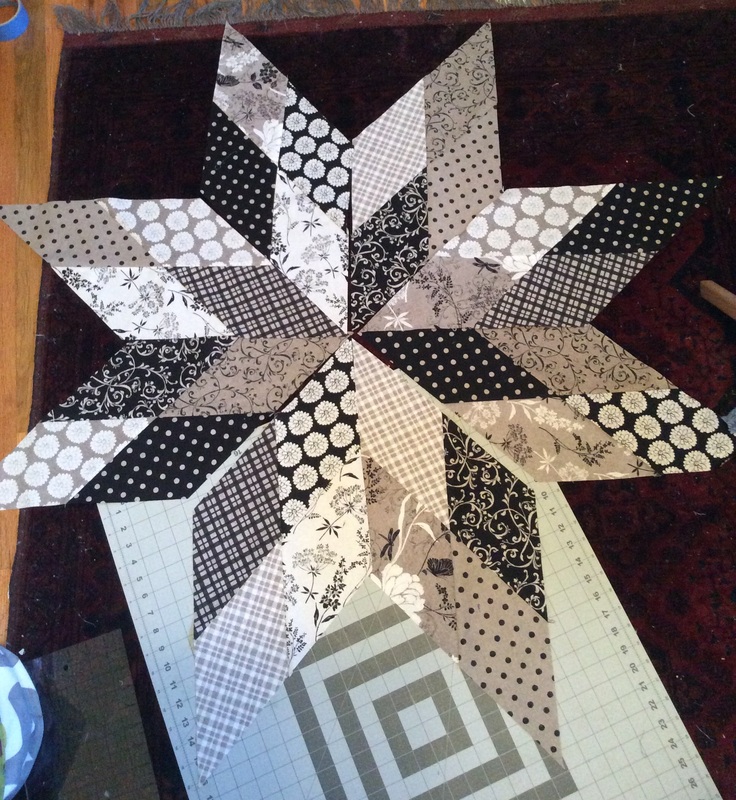 I chose to follow the Star Light, Star Bright pattern directions found here on the Moda Bake Shop website. I didn’t have quite the right ruler, but some painters tape took care of that. 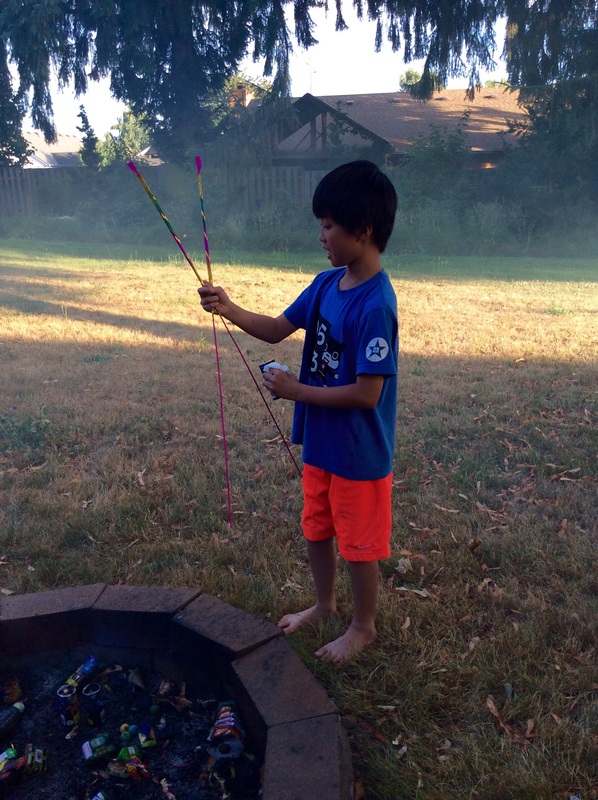 My triangles were 7 1/4″ high, making the diamonds 14 1/2″. The only pattern issue I had was with the measurements of the diamonds. 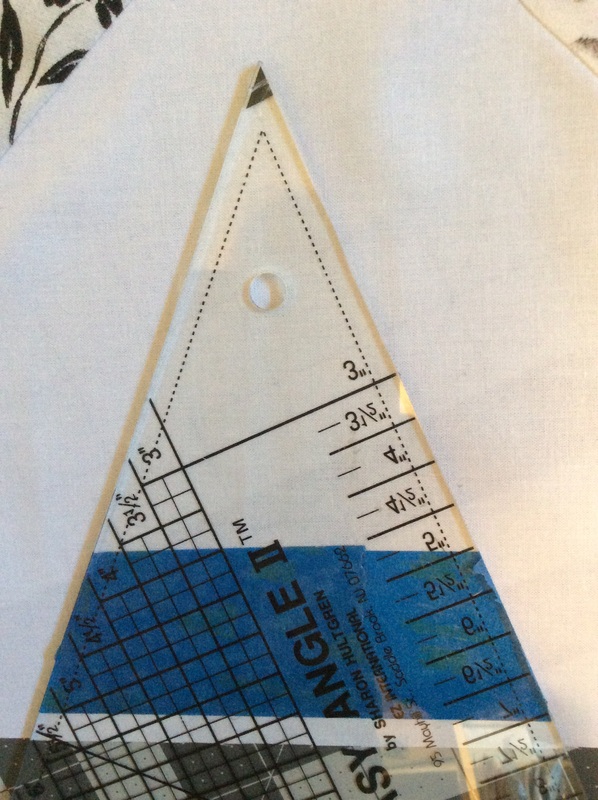 The directions told which 45 degree triangle ruler she used, but didn’t make it clear the exact size of the diamonds. Since I don’t have that ruler, I had to guess a bit based on the width of the fold that she suggested. 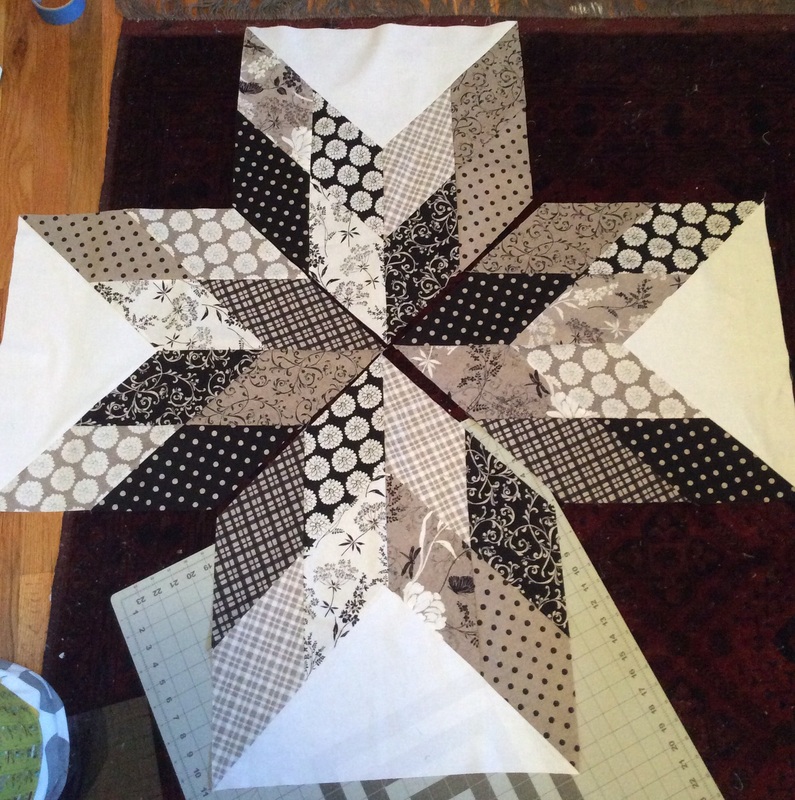 I obviously didn’t guess quite right because the squares that I cut for the corners ended up an inch too small, so I had to search out more white and cut new, bigger squares. Avoidable if the diamond measurements had been given! 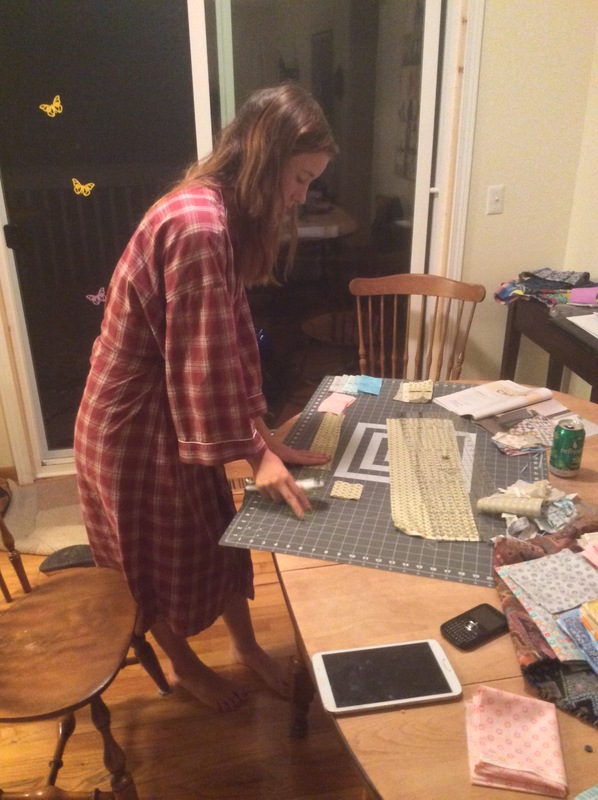 I sewed the pieces together in a slightly different order than the pattern called for. 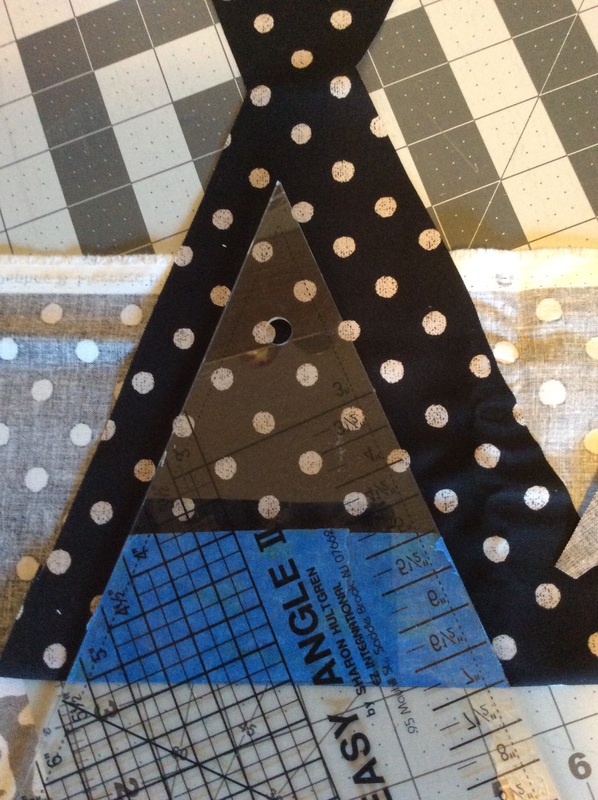 After doing the 8 diamond wedges, I added in the Y seam triangles before sewing more sections together. It probably didn’t make a difference, but I figured I’d be manuevering less fabric volume that way. If you look closely at these three in progress pictures, you’ll see that some of the diamonds moved around. 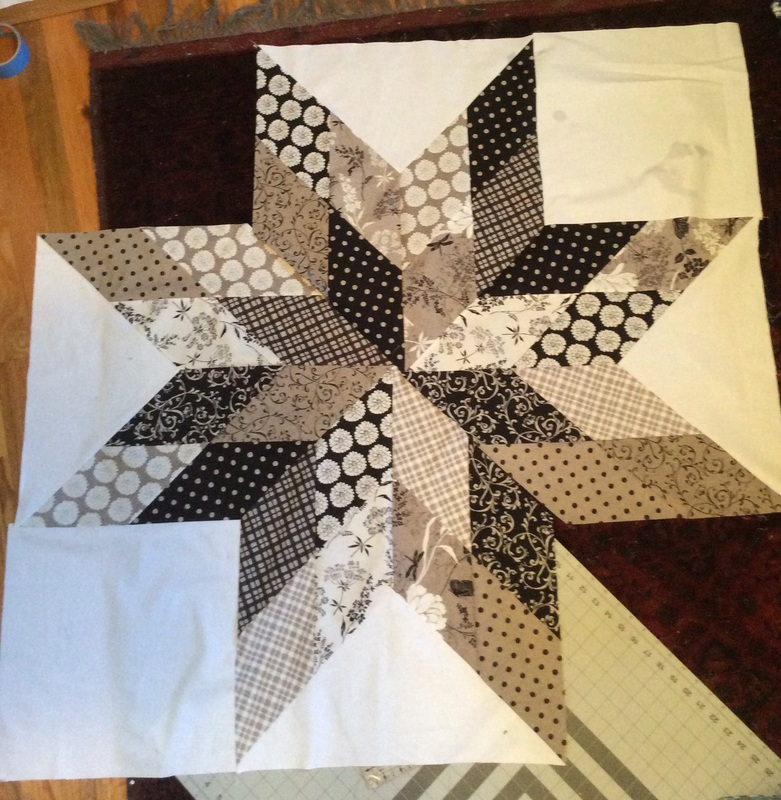 I didn’t always get the right edges sewn together, or notice in time to fix it. So much for my careful arranging when I started! I didn’t do a perfect job on all the Y seams. But they are pretty good, and I’m quite proud of my center points. Four hours from start to finish – my handy assistants helped me get the final picture, despite the wind and can’t-set-down-the-popsicle obstacles. 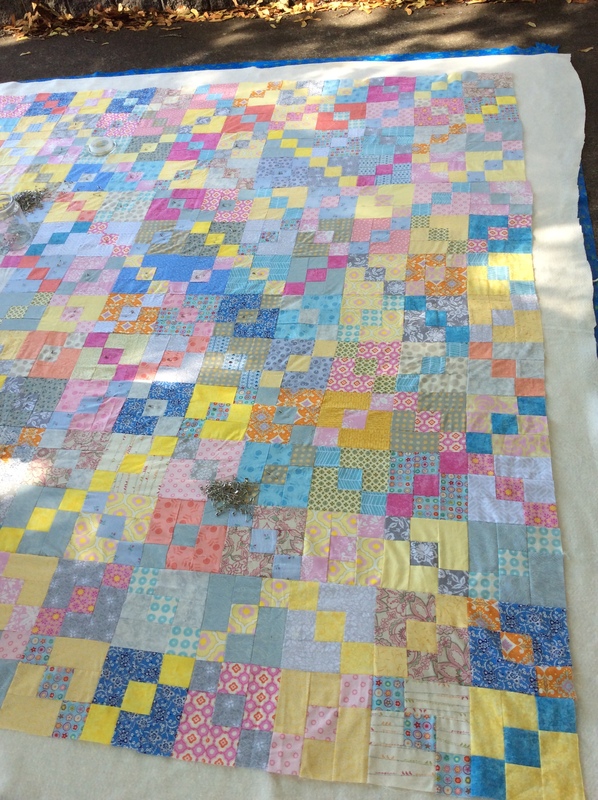 Tomorrow I hope to start quilting, but I probably won’t get it quite finished by her birthday on Thursday. But it will be far enough for her to see what it will be, and Mom isn’t picking about things like exact dates. It hit 102 degrees here yesterday. Around here, that is about as extreme as it gets (at least until this afternoon which is supposed to be worse. Seriously Portland, what are you thinking with this heat?! 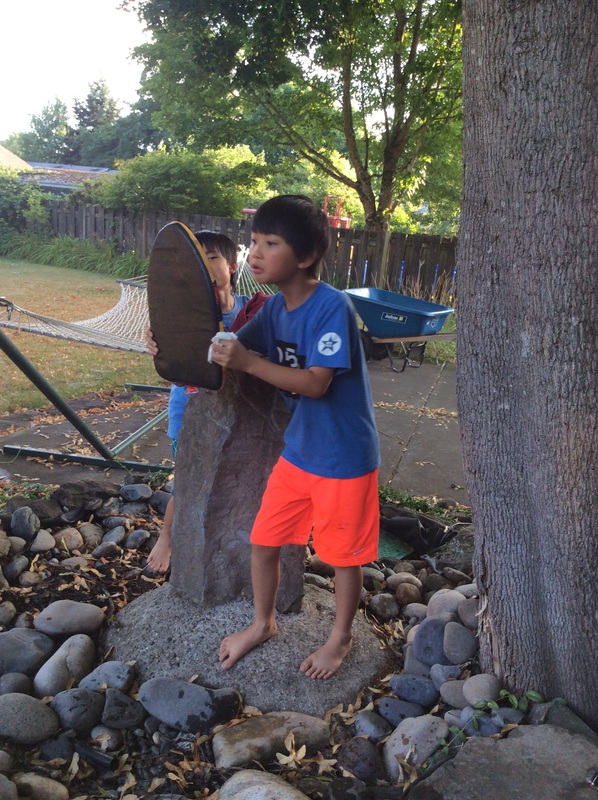 You’re in the PNW! Stop the madness!) So, I thought it would be a good idea to do some pin basting outside. Not my smartest heat wave activity choice. 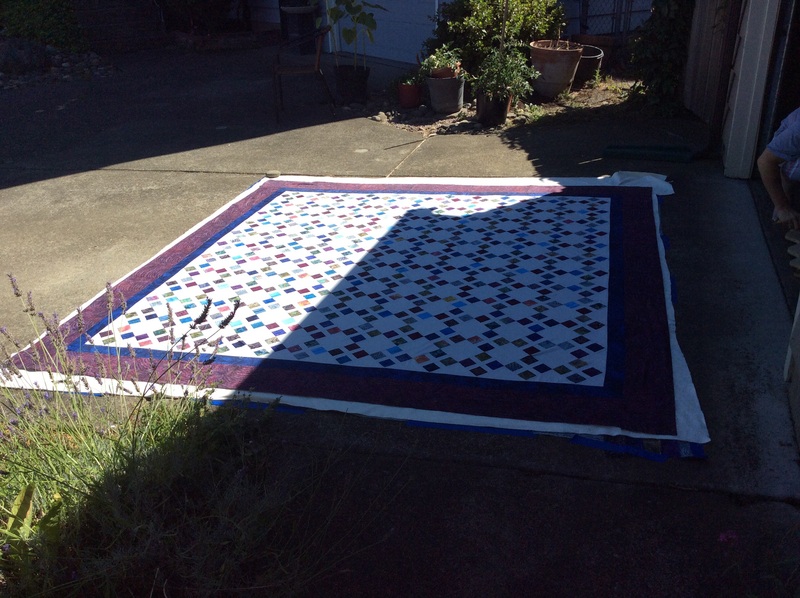 I don’t have a big enough floor area to spread out a quilt of this size indoors, so the driveway was really the only option until I get some folding tables, I swept away stray leaves and pebbles, got the gardening knee pad, and set in. A large sun hat helped, and so did starting in the sunny part so I could move back to the shade. But I’m pretty sure my neighbors think I’m crazy. Hard to disagree. 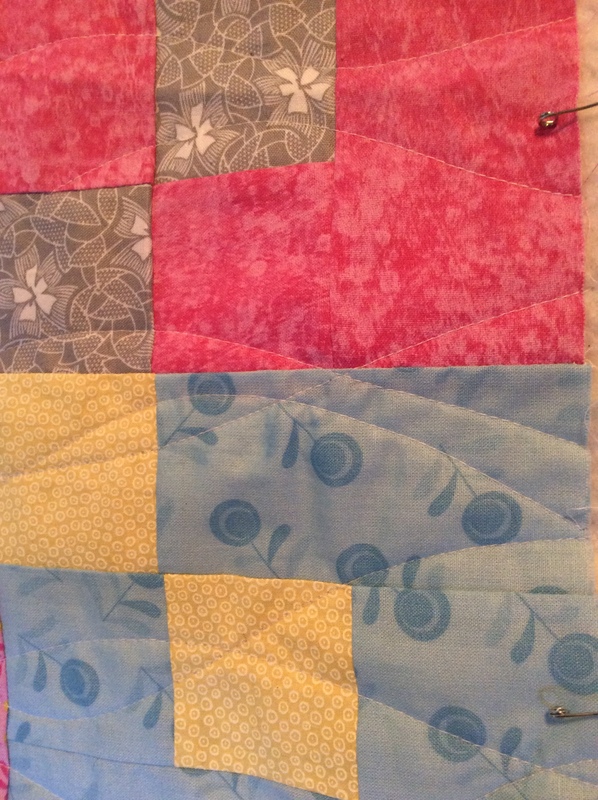 I put all the pins in colored squares as I’m going to keep the quilting to the gray areas. Still mulling the exact plan. 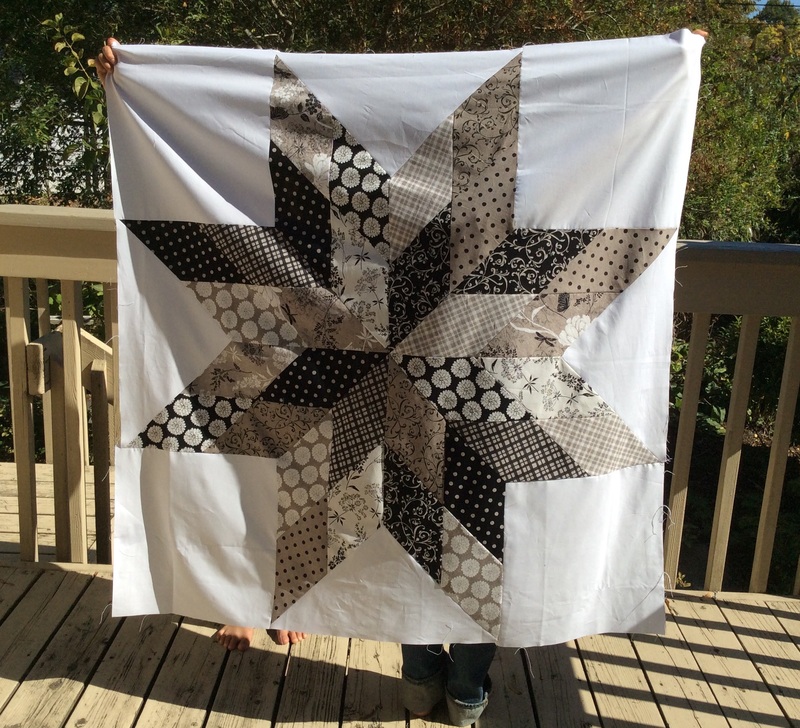 I’m so intimidated to start quilting this behemoth. Will the Juki’s harp and my dining room table be up to it? We’ll find out today when I get started. 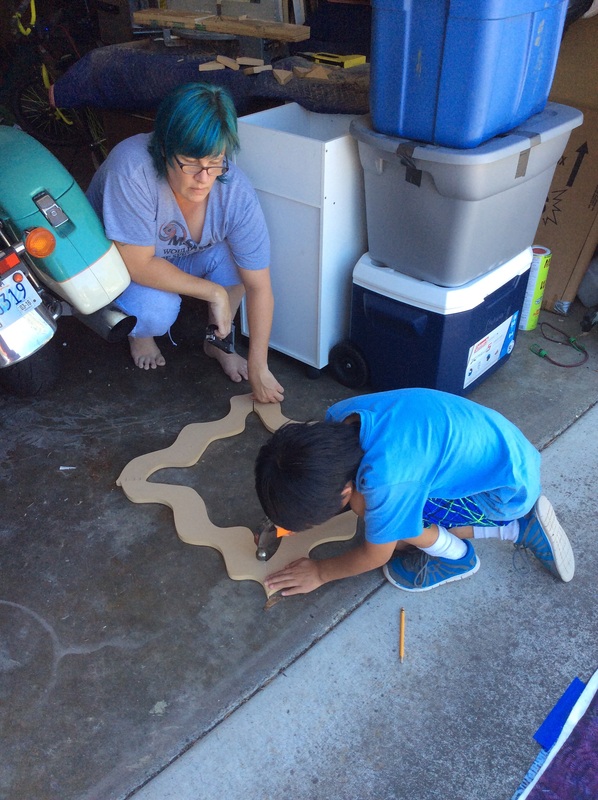 While I pinned, my sister and my youngest worked on Dr. Seuss frames she is making for her special ed classroom. She is going to paint them in wild, Seussian colors and hang student art in them. 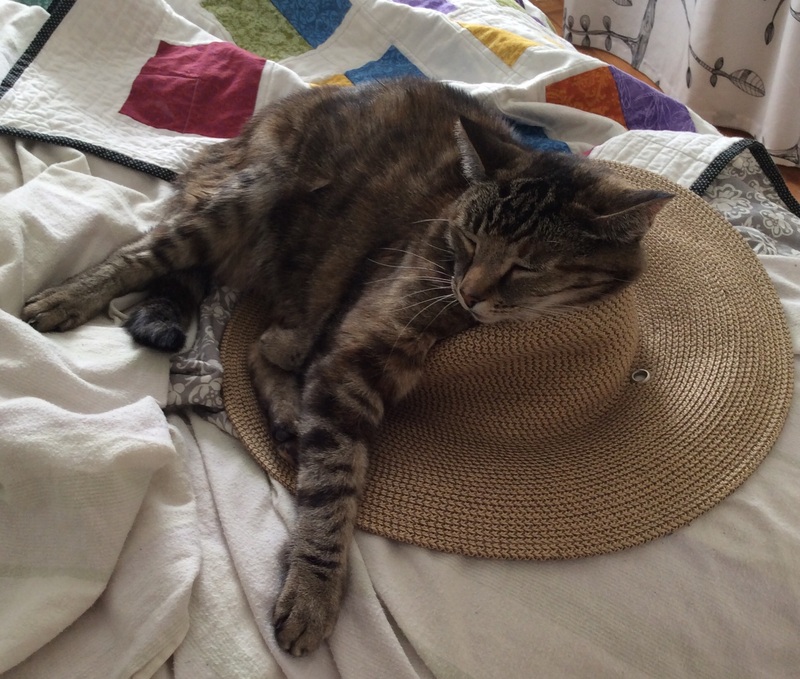 Meanwhile, the cat coped by strategically utilizing her own sun hat. 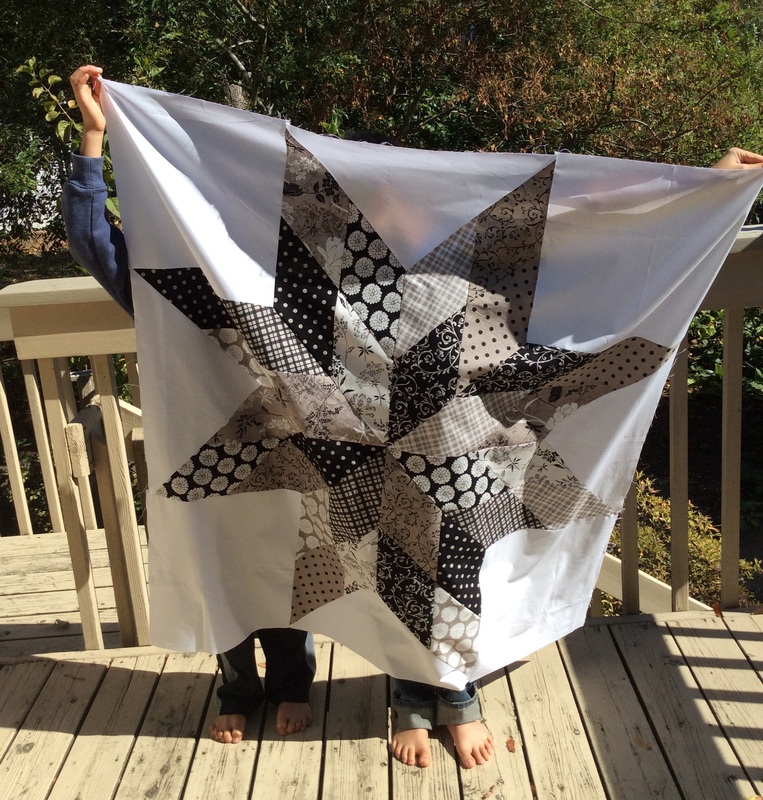 I then settled on the Amy Smart quilt – called Mooccan Tiles – for two important reasons. 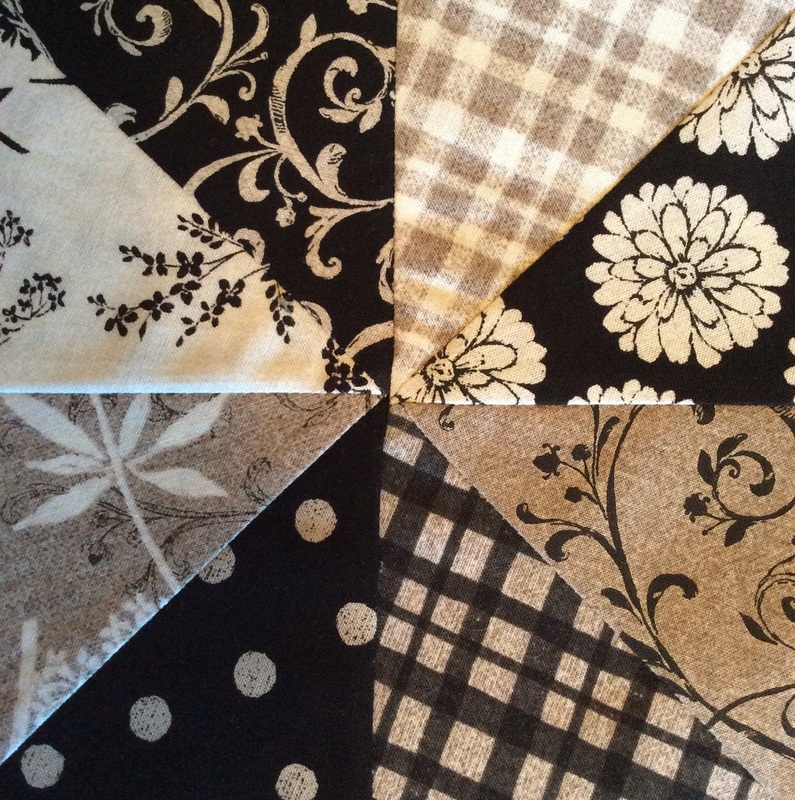 The first is the pattern for the blocks takes far fewer steps. 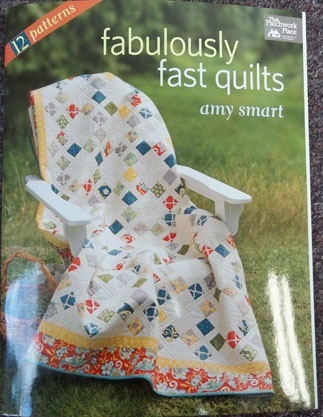 The second one is I already own the pattern book! 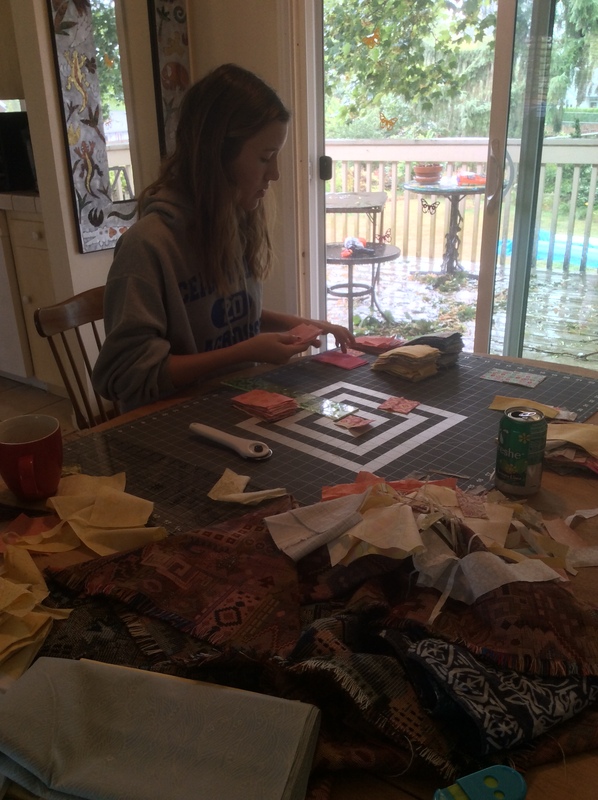 Next step was sending my cousin off to the fabric store near her to get print ideas. 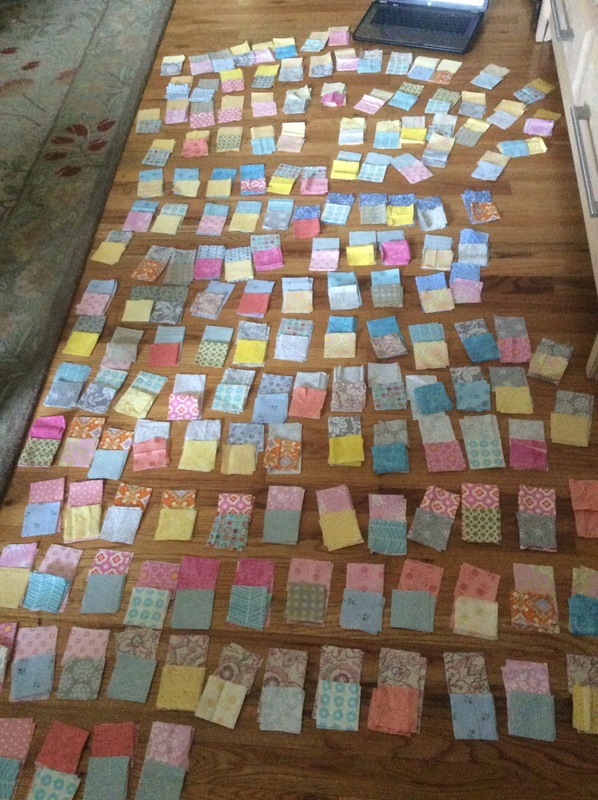 I sent yardage amounts in case she found fabric she couldn’t live without. 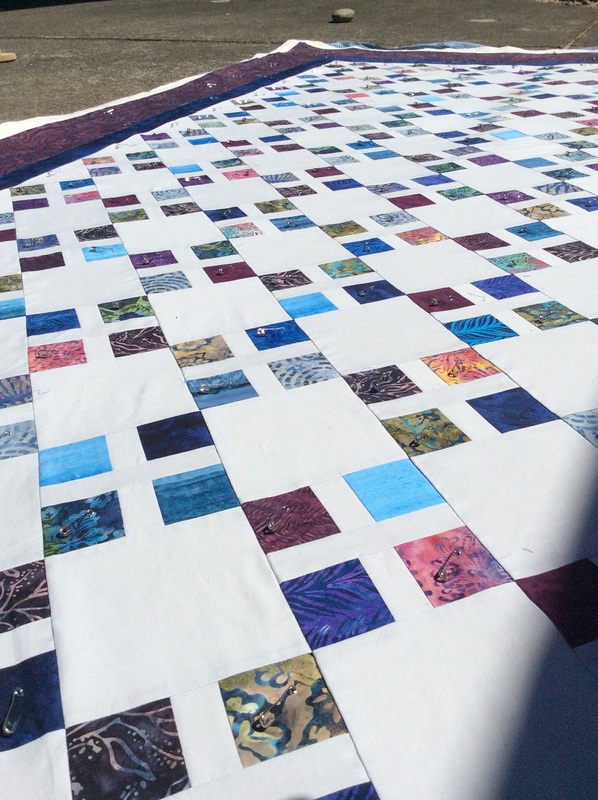 I think she found it a bit overwhelming, but it was useful because she decided she really loved batiks, and she found a blue that went with her current bed skirt so we could build the quilt around that anchor color. 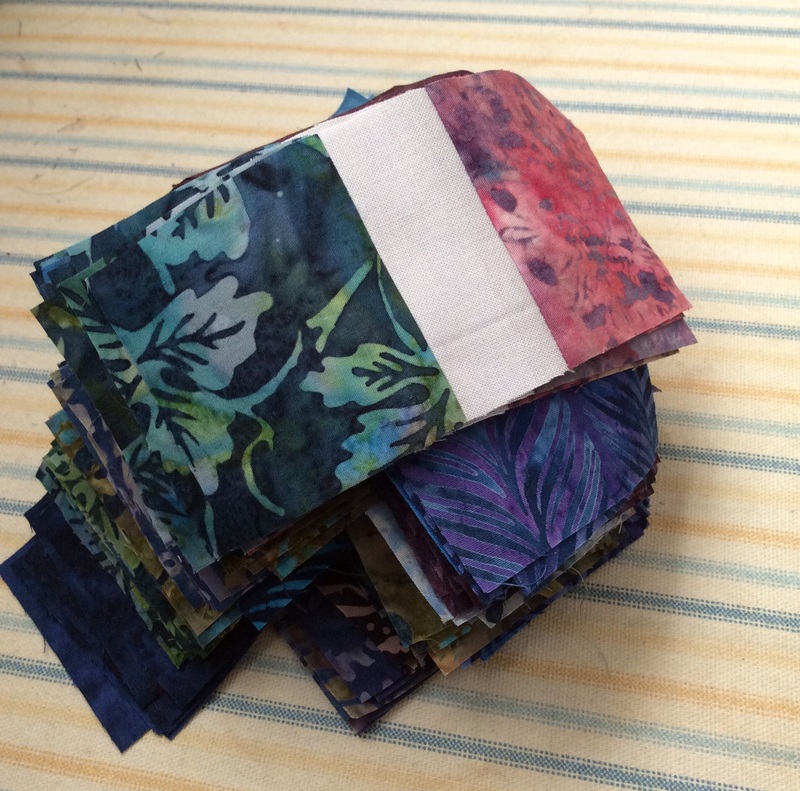 She ended up buying that blue and a few fat quarters of blue and purple batiks and mailing them to me. 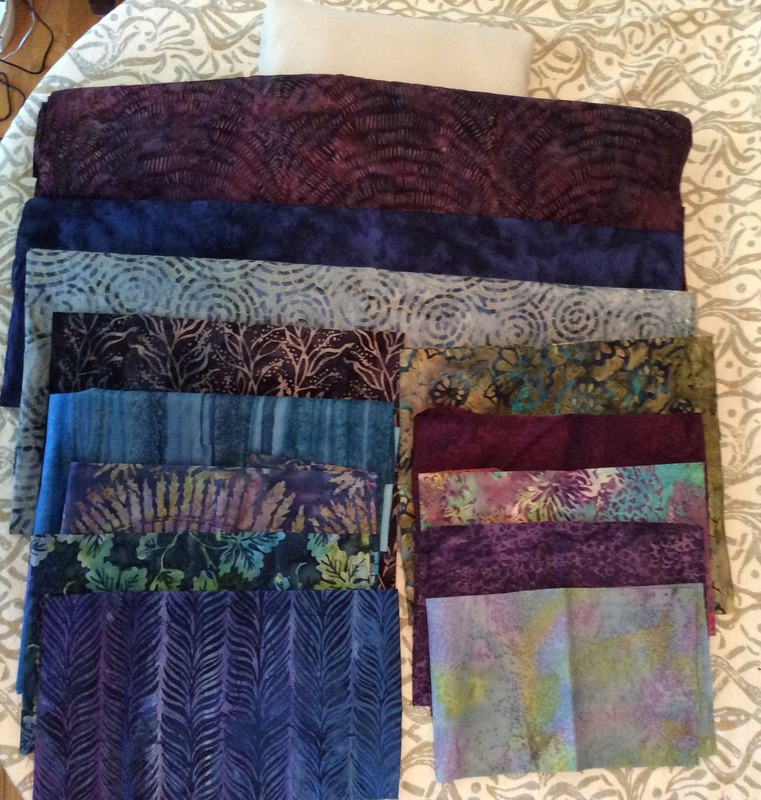 With those in hand, I went to the 35% off sale at Fabric Depot and bought a LOT of fabric. 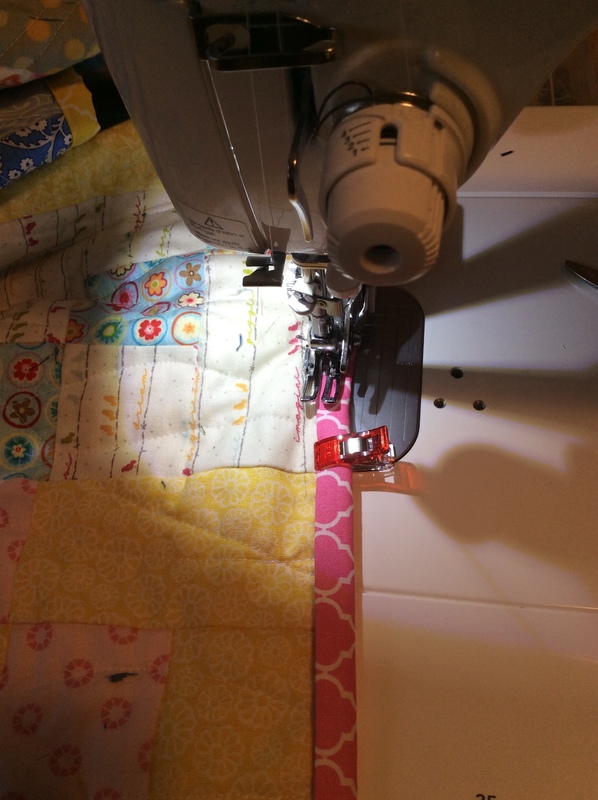 Because what makes this quilt not-so-fast is the fact that I’m scaling it up to 96″ x 96″. 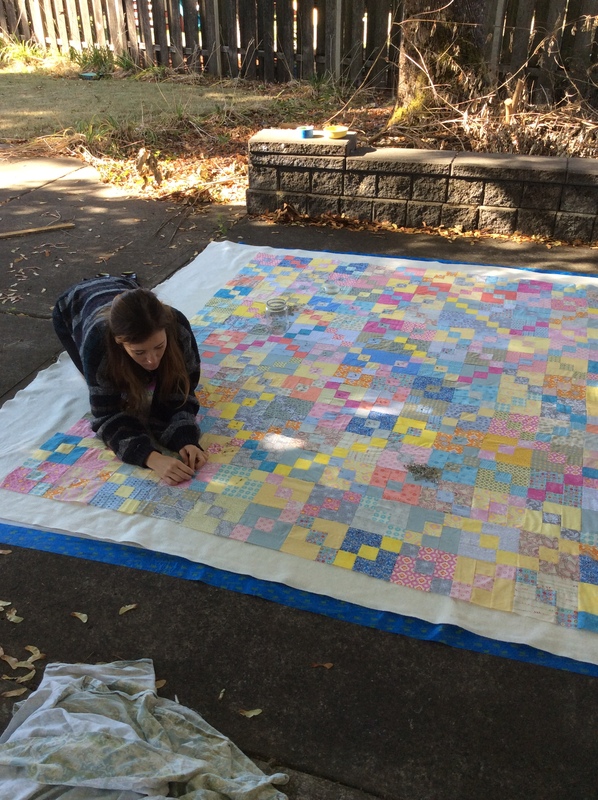 Not a small quilt. 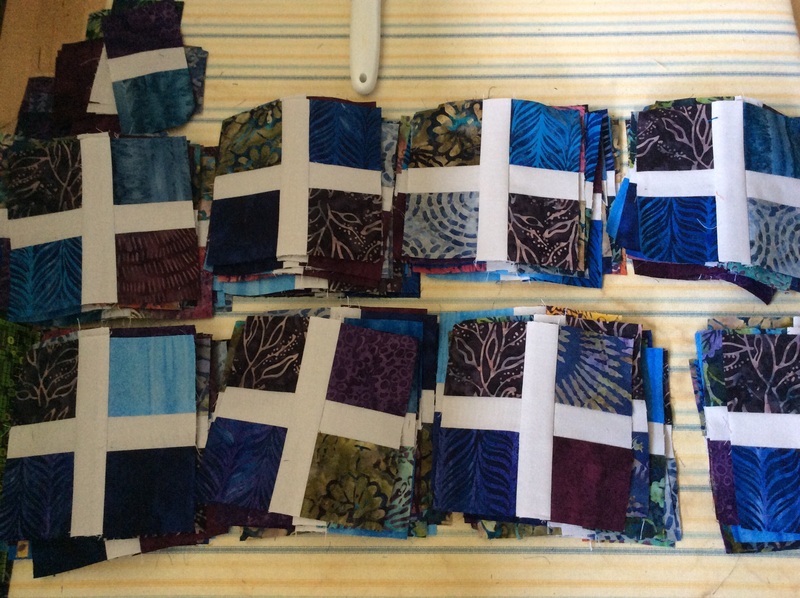 In fact, it will be the largest I’ve ever made, and I’m rather daunted at the idea of getting it all through my sewing machine. 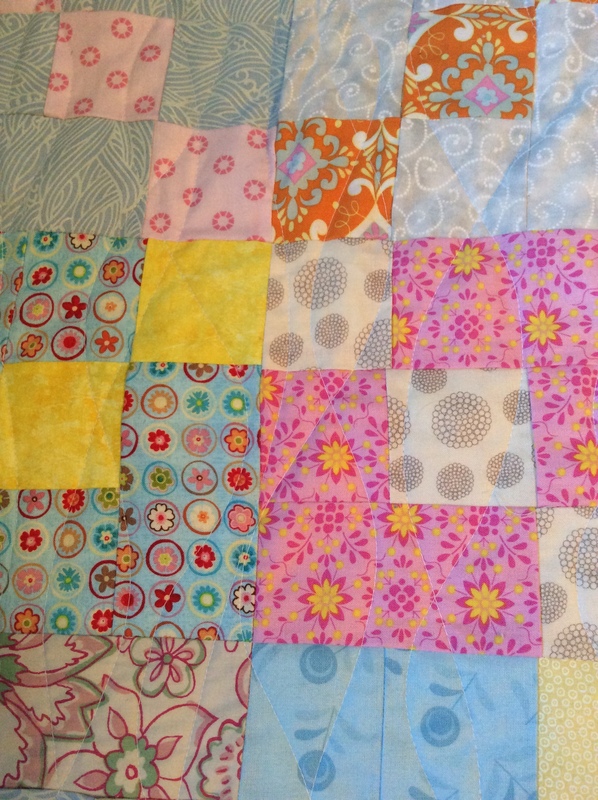 I’m still exploring the possibilities for quilting it in sections, but haven’t decided yet. 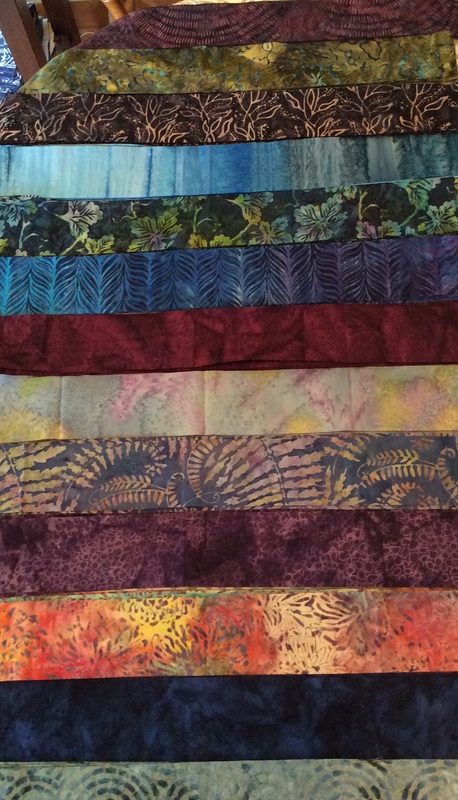 Those are the fabrics I ended up with after a long time pulling and replacing bolts in the batik aisle. 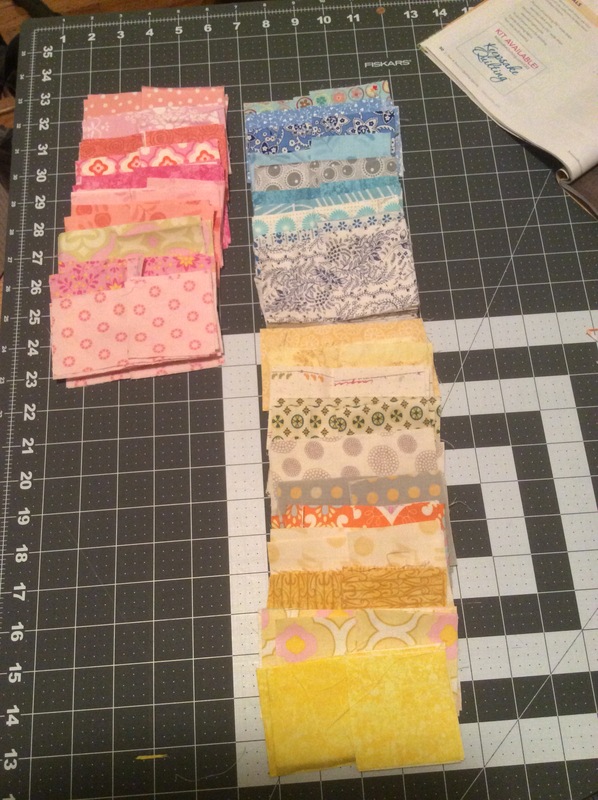 The deep blue near the top is her choice, as are a few of the fat quarters. I added more blues and purples and some green and magenta touches. The only one that isn’t going in is the one in the bottom right, as it just didn’t blend in with the others when I put all the strips together. Should have maybe figured that out before I cut it into strips! I started the cutting and sewing yesterday and I’ve made some real progress by this evening. That last photo is what 144 blocks looks like. I spent time trying to mix up the different prints as much as possible. No block has the same fabric twice, and then I made the piles to make sure that really similar blocks would not land too closely together. No guarantees, but the spread of prints should be pretty random. 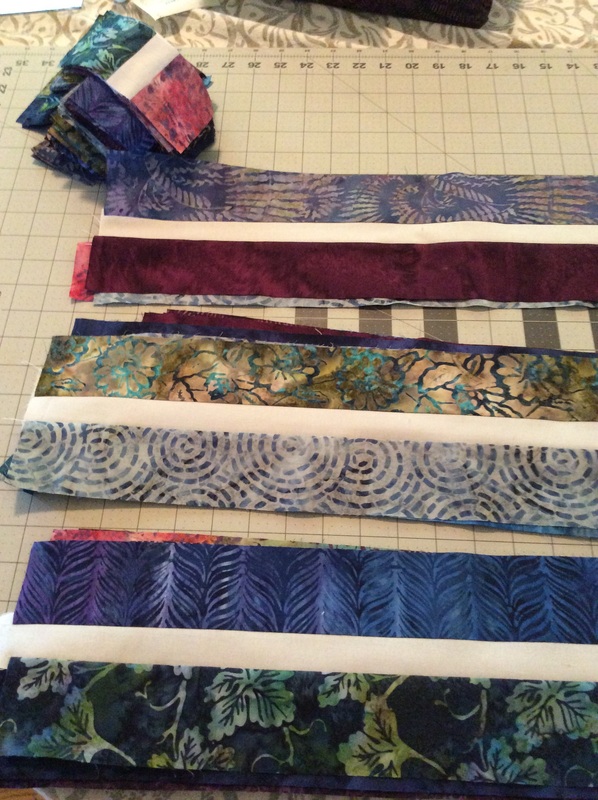 I’m completely enamoured of the colors, the batik fabric, and the pale silver Kona cotton for the sashing. Next step is to cut all the plain silver blocks that will go between the colorful blocks. There has been no more progress on the geese – I took a break to help my mom move out of my basement where she has been camping in my son’s lower bunk bed and into her new condo. My mom is a snow bird, in Arizona in the winter and in the PNW in the summer. 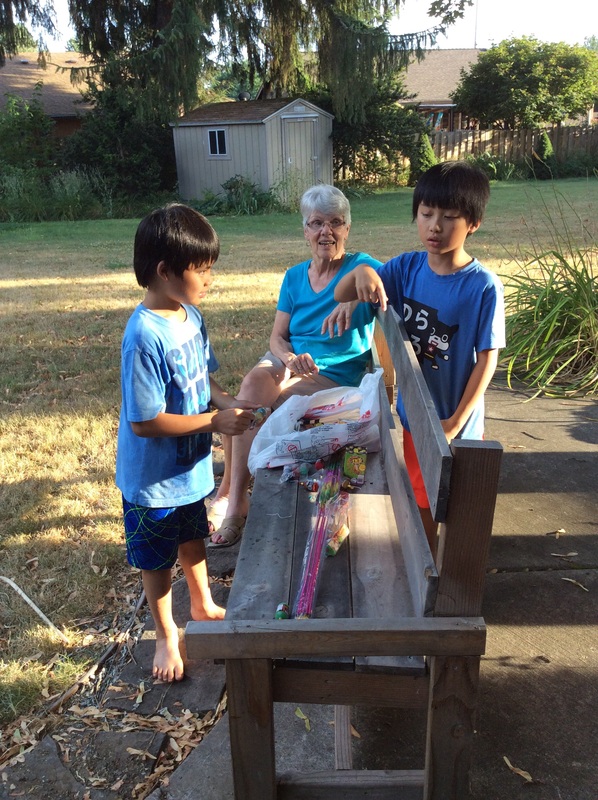 Last year she sold her condo in Seattle so she could move closer to us. But by the time the condo sold, it was nearly fall and she was worn out by the whole process, and decided not to hunt for a new place until this summer. We put all her stuff in storage and she went off to play pickleball in the desert sun. This summer, after a lot of hunting in two states, she found a condo just over the river in Washington. I wish she was a little closer, but I can drive by on my way home from work fairly easily, and my sister (who has been living in the other son’s room) plans to be on the same town when she moves at the end of the summer. Anyway, moving yesterday, unpacking today, and no geese before the sewing room got too hot each evening. 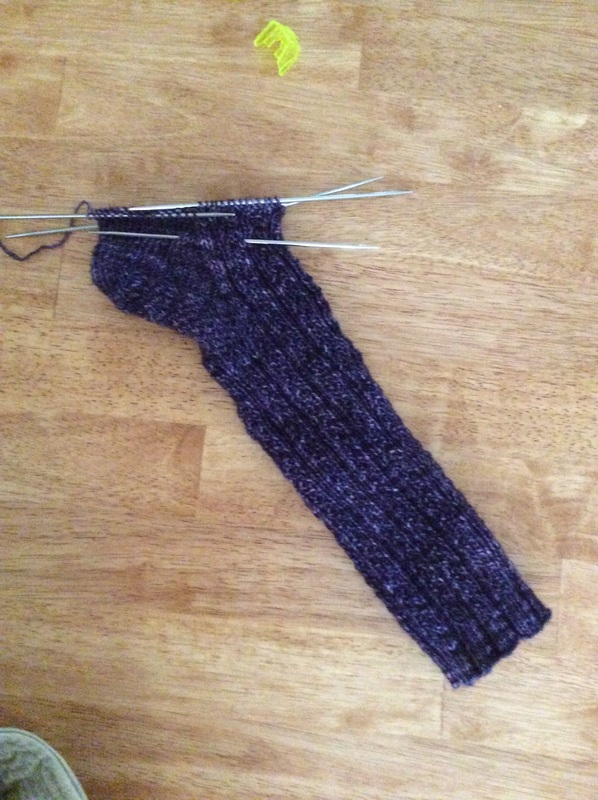 But I did get the heel turned on my Hedgerow sock. Pattern modifications so far – reduced to 60 stitches, changed heel flap to eye of partridge for additional wear protection.